Why are people from the Midwest traveling all the way to Green Bay, Wisconsin to get their Japanese Tattoos? The art of tattooing is a spiritual and artistic expression. It is a commitment and a passion. Katana Tattoo is a premier Tattoo Shop in the Midwest that specializes in Japanese, American and Traditional style tattoos. Located in Green Bay, WI, we serve clients in the upper Midwest and all over the country. A true hallmark of a reputable tattoo shop is the number of referrals they get from happy clients. Men and women from all over the country come to Katana Tattoo to get inked. Many of these people trust us for their most important tattoos because of the recommendations of their friends, colleagues and people they trust. This faith that people put in us is a testament to our integrity and the true artistry of our resident tattoo artists. Paul Dhuey is the founder and owner of Katana Tattoo. He brings to the table over 21 years of experience and is regarded as one of the world’s best Japanese tattoo artists. He has brought his tattooing expertise to some of the best tattoo shops in the United States and Europe. 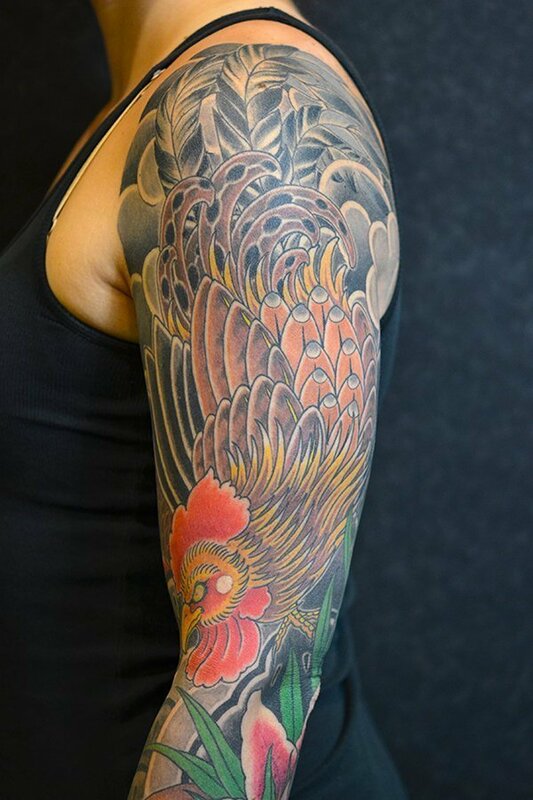 Recognized both nationally and internationally, Paul’s specialty is bringing traditional Japanese tattoos to life. Having spent the last nine years tattooing for the prestigious Guru Tattoo, Gallery and Left Hand Black Tattoo, Paul is your go-to guy for exquisite Japanese artwork for your skin. Like most in Japanese art, the art of tattooing or Irezumi has been around for many centuries. It began as a means of decorating one’s face and bodies for artistic and societal purposes but later as a means of branding and punishment. Outlawed in the 18thand 19thcentury, the art was introduced to traveling sailors which allowed the cultural symbols, motifs and styles to be known outside Japan and the world. While still shunned by the conservative Japanese today, the art of Japanese tattooing has gained worldwide popularity, especially in Midwest. Japanese body art mostly showcases Midwest’s proclivity and respect for nature especially flowers and animals. Moreover. Japanese tattoos with almost the same zeal also portray figures and portraits as representations of the wearer’s persona. A lot of Japanese tattoos portray animals that show courage and strength. For example, dragons, tigers and lions often depict a protective stance for the wearer. Historically popular as well is the Koi fish as this represents good fortune, success and good luck. Interested in getting a Japanese full bodysuit tattoo in Midwest? 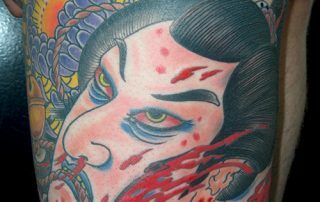 At Katana Tattoo we specialize in providing large tattoos including the Japanese bodysuit the entire portion of your body. Known for their beautiful and eye-catching designs, bodysuit tattoos are not for everyone but for those that want the full treatment, we can guarantee a beautiful outcome that you will surely appreciate. The bodysuit tattoo is not exclusive to Japan but it generally refers to a rite of passage, a symbol of marriage or a status symbol. The main area that comprises the Japanese bodysuit tattoo is the back piece with full background. This tattoo covers the entire backside from the neck until around twenty to thirty centimeters just below the buttocks crease. The reason being this is the largest area that can be seen in just one look. Let Katana Tattoo realize your desire of getting the ultimate Japanese bodysuit tattoo. We are just a quick drive from Midwest and we guarantee it will be worth the trip! In the past, full body tattoos were considered taboo but today tattoos generally are accepted almost everywhere. Full body tattoos are artistic and visual expressions and they are a sight to behold for the wearer. If you are ready to take the jump to have a Japanese full body tattoo, let our Katana Tattoo artists talk you through the many design options to choose from. Getting a tattoo is a commitment, getting a full body tattoo is a lifetime goal. If you want to achieve the dream of getting inked all over your body, let Katana Tattoo help you in the selection and placement process. Our team of resident tattoo artists are recognized in Midwest and the world over for their talent and experience. Let us guide you in making this dream come true. One of the more popular places to get tattooed is the shoulder. As a matter of fact it poses an advantage when compared to other areas of the body owing to the fact that the shoulder structure changes very little. Katana Tattoo a destination tattoo shop for residents of Midwest and are experts on Japanese shoulder tattoos. Choose from a wide array of designs ranging from mythical creatures or real life samurai warriors. No matter what your idea is, our resident tattoo experts can help you pick the best design that will complement your body type. When it comes to tattoo art, the Japanese tattoo is considered to be one of the most popular in Midwest. In traditional Japanese culture, a tattoo often symbolized spirituality, purpose and status. Originally, the Japanese tattoo conveyed status a person enjoys in society but it evolved when spiritual symbols were used as a form of charm or protection and also a means of signifying devotion. During the course of many years, Japanese tattoos were used to brand someone, similar to what the Romans did with criminals so that they can easily be recognizable. However, this practice faded through the years and the Japanese tattoo regained its original meaning, which was as a status symbol worn by rich traders who ironically were not allowed to display their wealth. After the 2ndWorld War, none other than Japan’s divine emperor deemed tattoos illegal in an effort to repair the image of Japan with the world. Later on, the criminal element in Japan, the Yakuza adopted a certain tattoo style, which would later become a status symbol in their organization. When you see a Japanese tattoo made by Katana tattoo artists, you will instantly be amazed at the strict attention to detail, color and adherence to proper placement on the body. So make the drive up to the shop from Midwest and get started today! When it comes to colorful and creative body art that portrays the human form, quite a few can compare to the majesty and grace of the Geisha. The Geisha in traditional Japanese refers to artist or performing artist and they are female hostesses with exquisite talents in conversation, music and dance. The beautiful Geisha tattoo is worn by both men and women and is also a very popular request here at Katana Tattoo. The Geisha tattoo symbolizes exotic grace and divine beauty. Katana tattoo artists convey very colorful and intricately designed pieces to fully capture the beauty of this mysterious creature. The geisha is a representation of female power and mystery. Her specialized talents and refined ways make her elusive and almost unattainable. She represents aspirations, dreams and desires. 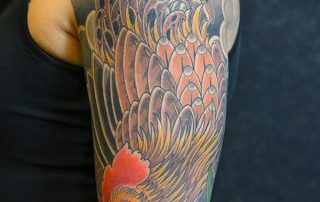 Katana Tattoo specializes in exquisite and intricate Japanese tattoos like the beautiful Geisha for Midwest residents.